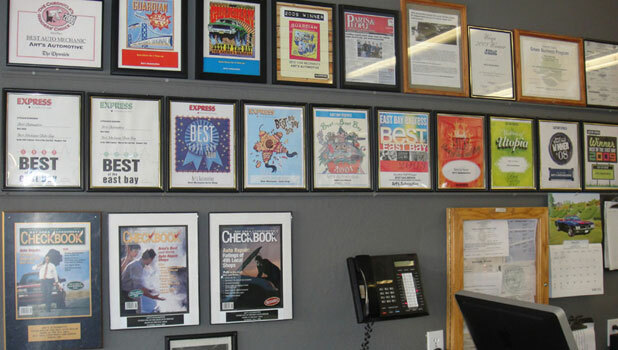 Looking for good auto repair shops in Berkeley? Our reputation has grown by word of mouth for 35 years now. We never sell unnecessary repairs or cut corners to make an extra buck; we want you to be our customer for years to come. Some shops might turn you upside down and shake you once you’re in the door, but not here at Art’s Automotive. See all the glowing reviews and commentary below, and remember: if you’re happy with your service, spread the word! If there’s a problem, let us know! We want you to be happy with the work we do. We are humans with real feelings, and we sometimes make mistakes. Give us the opportunity to right the wrong! While we could toot our own horn, it’d probably be more believable coming from someone else 🙂 Below are some kind people who’ve had nice things to say about us. Thanks kind people! I hope we will continue to make you happy. Just so you know, it make us feel good when people thank us, so if you’re happy let us know. If not, we need to know that too so we can improve. Art’s is great. They plan on you being a repeat customer (because of their awesome treatment and skilled mechanics) so they don’t have a reason to try and rip you off or try and get you to do repairs that you don’t need yet. I started going to Art’s when I got my first car, and I did so because my mother started going to Art’s in the 80’s and has been going since. When I bought my most recent car, I was reluctant to get a car that Art’s didn’t repair because I didn’t want to have to find another mechanic. Anyway, I totally trust Art’s and I can’t imagine taking my car anywhere else. You don’t need to take your car to a dealership for service. I take my Nissan to Art’s Automotive on San Pablo, 2 block’s north of Ashby. Art’s does a lot of Toyotas, too. Art’s is a very skilled and honest shop. They know the cars they work on well, they are professional and pleasant to work with. I’ve been taking my Nissan to them for 10 years. I took my Toyota to them before that. When I was looking for a car 10 years ago, I got a brand that I knew Art’s would work on. By the way, they also do work on Priuses. How can I explain in a few words the passionate loyalty I, and so many others, have for this place? They are absolutely honest, smart about cars and ecolgy, kind and patient. Spend some time on their website . . . and you’ll get some idea of why they are so special. I’m fortunate in driving one of the Japanese car brands they work on. Considering bringing your car in? Please read our new customer orientation here on the site to get a sense of the way the shop functions. If you want to schedule an appointment, click here to find out how.